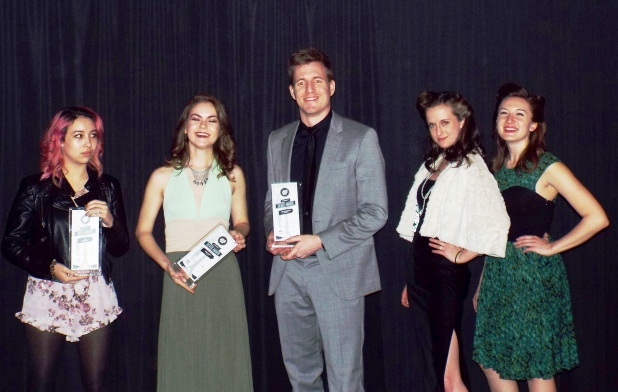 NIC students stand with their Addy Awards at the American Advertising Federation awards show in Spokane recently. The students are, from left, Madion Inouye, Katelyn Halpin, Doug Anderson, Hannah Stack, and Julie Sutcliffe. Not pictured is Addy award winner Ben Clark. Four North Idaho College students took home gold and silver awards at the 2017 Addy Awards in Spokane recently for graphic design. The American Advertising Federation – Spokane puts on the annual awards, which is one of the biggest of its kind in the area. All gold and silver awards are eligible for competition at the district level. Madison Inouye, of Post Falls, won a Gold Addy in the Still Photography – Single – Digitally Enhanced category. Douglas Anderson, of Coeur d’Alene, won a Silver Addy in the Sales Promotion – Packaging category. Ben Clark, of Coeur d’Alene, won a Silver Addy in the Illustration – Single category. Katelyn Halpin, of Coeur d’Alene, won a Silver Addy in the Magazine Advertising – Campaign category. In addition, two NIC graphic design majors, Hannah Stack and Julie Sutcliffe, both of Post Falls, were awarded Toni Marie Robideaux Scholarships. In the last 13 years since the scholarship has been awarded to aspiring design students, NIC students have received it 13 times. The TMR Scholarship is a $1,000 scholarship that was created in memory of Robideaux, one of AAF Spokane’s most influential leaders, and recognizes and rewards student achievement and excellence in the arts. “Recent NIC graduates also received awards – this time as design professionals. Corey Jeppesen, now a graphic designer, started his own company: Seejepp Creative Studio. Jeppesen along with NIC program graduate and now professional designer Jon Hayenga, earned a several Addy awards,” said Philippe Valle, NIC graphic design instructor.